Technically, summer doesn’t start until June 21. But many people consider Memorial Day to be the unofficial start of the season. This year, we celebrate the holiday on May 25. Many families will heat up the grill, head to the beach or take in a big blockbuster movie. But Memorial Day has the word “memorial” in it for a reason. 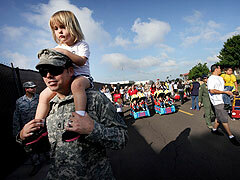 Soldier Donnie Terrell, a member of the U.S. Army, carries his daughter Hailey during a parade at MacDill Air Force Base in Tampa, Florida. The holiday got started on May 30, 1868, when Union General John A. Logan declared the day an occasion to decorate the graves of Civil War soldiers. Twenty years later, the name was changed to Memorial Day. On May 11, 1950, Congress passed a resolution requesting that the President issue a proclamation calling on Americans to observe each Memorial Day as a day of prayer for permanent peace and designating a period on that day when the people of the United States might unite in prayer. President Richard M. Nixon declared Memorial Day a federal holiday in 1971. Memorial Day is now observed on the last Monday of May. It is an occasion to honor the men and women who died in all wars. This weekend is about WAY more than BBQ, cookouts and parties. That doesn’t mean we shouldn’t join in with our friends and loved ones in enjoying the weekend. Please just take a moment to raise a toast to those who gave you the freedom we get to enjoy this weekend.